Modern house in the countryside in exposed concrete and fully glazed south / west facades realized, with beautiful views of the imposing mountains. Good connection to the charming spa town Meran with bus stop next door. Covered, shielded parking. Village center of Scena with shops, bars and restaurants just 100 meters away. Modern outdoor pool with great views and water attractions in the immediate vicinity. Numerous hiking possibilities and excursion destinations around Scena. The spa town of Merano is 5 km away: Italy's most beautiful botanical garden, large spa area, festivals, markets, bustling shopping center, horse race track with many famous races.
. 1 Bathroom with bath and shower, toilet, hairdryer, soap, cream, shaving mirror. . 2 Bathroom with shower, toilet, hairdryer, soap, cream, shaving mirror. Central location for the many attractions in the area: Castles, spas, public, very nice swimming pool in the immediate vicinity, botanical gardens, museums, cable cars after> Meran 2000, according to Vigiljoch, the Texel Group Nature Park, the glacier in Val Senales. And last but not least the spa town of Merano is 7 km away. By bus and on foot within easy reach. Tolle, großzügige und voll ausgestattete Ferienwohnung mit Wohlfühlgarantie! Wir waren als 3-köpfige Familie für 13 Tage zu Gast in der Ferienwohnung Nr. 2. Wir hatten eine wunderschöne Urlaubswoche in dieser modernen Designerwohnung in Schenna. Alles war sehr gepflegt und besonders sauber. Es fehlte wirklich an nichts. Durch die großen Fensterfronten hatten wir einen tollen Bergblick. Auch lies sich die Wohnung perfekt gegen Sonneneinstrahlung verdunkeln, so dass immer ein herrliches Raumklima herrschte. Der Vermieter Herr Josef Gritsch war sehr nett, zuvorkommend und hilfsbereit. Durch die zentrale Lage der Wohnung waren unsere Wandergebiete sehr schnell erreichbar. Danke liebe Petra und Sigmund, Ihr ward bezaubernde Gäste. Wenn meine Gäste zufrieden sind, dann bin ich glücklich,-ist es doch meine Aufgabe beizutragen, dass der Urlaub meiner Gäste möglichst schön wird. Ich wünsche Euch alles Liebe und Schöne! 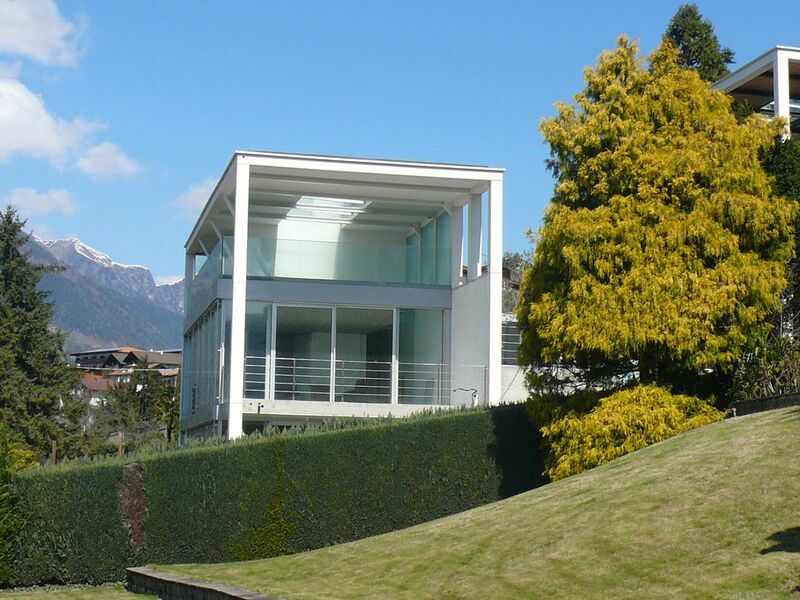 The villa is located in Alvarium Scena, a hiker's paradise on the sun terrace of Meran, with only two apartments: modern, spacious with a private atmosphere. Garden with Mediterranean plants. Only 500m from the town center. A modern outdoor pool with many attractions can be reached in 10 minutes on foot. Wonderful view of the mountains around Meran. The charming spa town is only 5 km away: the most beautiful botanical garden in Italy, sprawling spa complex, wine, and Klass. Music festivals, promenades, markets and a bustling business center. Attractions in the immediate vicinity, such as Merano 2000 and Vigiljoch, wonderful skiing and hiking areas, the Nature Park Texelgruppe with various cable cars, as well as the opening into Merano, adjacent valleys Ultimo, Vinschgau and Passeier.